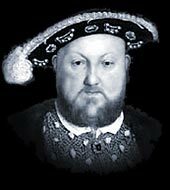 The father of King Henry VIII was Henry Tudor (who became King Henry VII). Henry was a member of the House of Lancaster. England had entered a long period of Civil war called the War of the Roses between the two most powerful noble factions of England called the House of York and the House of Lancaster. A final Lancastrian rebellion rose against the Yorkist King Richard III following the disappearance of the Princes in the Tower, who were the two young sons of King Edward IV. Henry VII defeated the Yorkist leader King Richard III in the Battle of Bosworth Field and claimed the throne of England becoming King Henry VII. The Dynasty of the Tudors was born, but it was was shaky claim based on an illegitimate Plantagenet line. The Lancastrian King Henry VII therefore cemented his claim by marrying Elizabeth of York, the Yorkist daughter of King Edward IV. The Houses of York and Lancaster therefore merged leading to the creation of the emblem called the Tudor Rose. The national flower of England is the rose which was adopted as England’s emblem during the time of the Wars of the Roses (1455-1485)). The design took the white rose of York as the center of the flower, and the red rose of Lancaster as the outside edging. The design symbolised unity and mutual regard. The Tudor Rose emblem can be found on many old buildings in England. Hampton Court Palace built by Thomas Wolsey and 'acquired' by King Henry VIII has many examples of the Tudor Rose. The most notable examples can be seen on Anne Boleyn's Gate. The ceilings of many old English houses are also adorned by the emblem. Wherever it was feasible, a Tudor rose would be carved. A Tudor Rose was found carved on to a gun on the Mary Rose ship. The tradition and emblem is still used in modern day England. Even the current 20p coin displays a Tudor Rose. Each section of this Tudors website addresses all topics and provides interesting facts and information about the Tudors. The Sitemap provides full details of all of the information and facts provided about the fascinating subject of the Tudors.